Unexpectedly, or maybe not, the way he struggled from the onset of the tournament, Federer lost to Tomas Berdych today in the quarterfinals. We all know the details: the end of his finals streak there, two quarterfinal losses back-to-back in Majors, blah, blah, blah. Yep, that little phrase makes me optimistic about Federer's results for at least the next couple of years. Based on his insane results in Majors, the Aussie is the second toughest among the four for Federer to win. To do that after coming off some tough losses at the end of last year, and taking out some players that were starting to find some chinks in his armor--such as Nikolay Davydenko and Andy Murray--shows that his will to win is extraordinary and that he still has plenty left. Your game doesn't disappear in the span of six months. Look at how he came out, though, at this tournament: Struggling against players with no grass-court pedigree makes it look like something was wrong with him physically to me. Not to take away from Berdych's win by any means, because he definitely came up with the goods, but I would think Fed would have enough grass-court savvy to handle anyone--even one of the game's biggest hitters. And just to be clear, if this is your first time coming to this site, I'm not a "Fed-Head," I'm just calling them as I see them. And despite the recent run of bad form, what I saw from Federer at this year's Aussie indicates he'll still be OK for a couple of years yet to come. 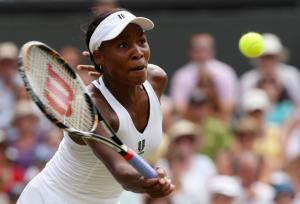 A day after Andy Roddick's shocking loss to Yen-hsu Lu, the biggest surprise of them all comes with Venus Williams going out 6-2, 6-3 to Tsvetana Pironkova in the quarters. Williams didn't exactly play the cleanest match of her life with tons of errors and double-faults, but you'd still think she'd be able to get it done. 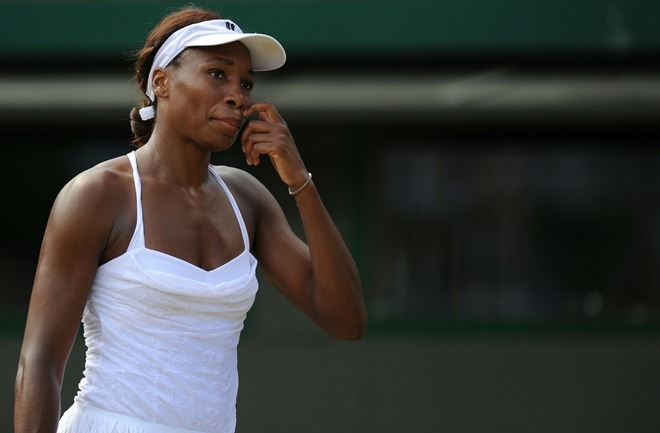 After all, she is Venus Williams! Credit, though, to Pironkova for getting it done. And how about Vera Zvonareva making it through to the semis? And doing it by rallying from behind, at that! I wouldn't mind seeing her make it to the finals against Serena. But perhaps I shouldn't be looking to far ahead: We might end up with a Pironkova-Petra Kvitova final the way things are going! And about that Roddick loss: Man, that sucked. But credit to Lu for taking advantage of his opportunities. I hope A-Rod bounces back for the U.S. Open. Maria Sharapova, too. Anyway, I guess we'll see what craziness tomorrow brings: Maybe the Lu train will keep rolling! That was some week, wasn't it? Now after marathon matches and players spitting toward fans and top seeds struggling, we're in the second week of Wimbledon. There's tons of matches that are expected to be some real humdingers (how many times have you seen the word "humdinger" on a blog? ), but there's one I think will be the humdingerest! It involves your women's top seed Serena Williams against your 16th seed, Maria Sharapova, in a rematch of their 2004 final at the All-England Club taken by Sharapova. Now a lot has happened for both of those players since then: from Serena sinking to her lowest ranking since her rookie days to emerging back on top of the heap to Maria winning a couple of more Slams and then getting felled by a serious shoulder injury. Sharapova's done a decent job of making her way back from that, but she still hasn't had a defining win yet to prove that she can be a contender at the Slams. I picked her to get to the finals before the tournament, and I'm still sticking with that. Williams has been in pretty devastating form, but I just have this feeling that Sharapova—driven by that need to show she's back—ekes this out. Either way, it'll be a slugfest, maybe one we'll talk about for days to come! * And an extra note: Roger Federer really struggled early on last week, and I think he's lucky he didn't have to play Jurgen Melzer then. He should get by him fine now. It's been an interesting first two days at Wimbledon, huh? All kinds of stuff has been going on: from James Blake yelling at commentator Pam Shriver to French Open finalists Francesca Schiavone and Sam Stosur getting knocked out in the first round to high seeds getting pushed to the distance or knocked out of the tournament. 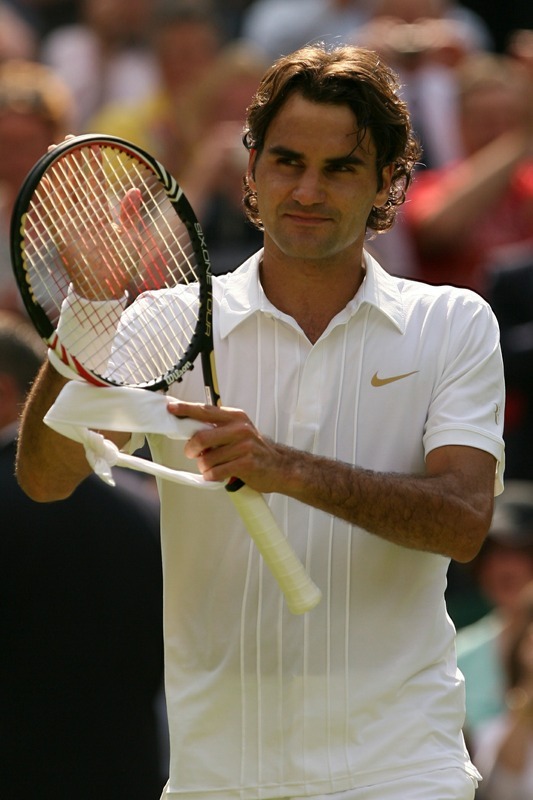 How about that Roger Federer/Alejandro Falla match? You hate to see a guy like Falla not have all that hard work rewarded, but give it up to Federer for fighting through. Tomorrow's match should go a lot easier for him against Ilija Bozoljac. I'm assuming it should be nothing less than a cakewalk. Looking down the road, however, things could get a little tricky in the round of 16, where either Feliciano Lopez or Jurgen Melzer--lefties a little more dangerous than Falla--could potentially lurk. My picks have already gotten hit hard as I lost two semifinalists, Marcos Baghdatis and Sam Stosur. Dang them! I hope one more of my picks is OK tomorrow. Andy Roddick could have a SERIOUS match on his hands tomorrow against Michael Llodra. If Roddick manages to blast him off the court, he should be considered in great shape for a big run. 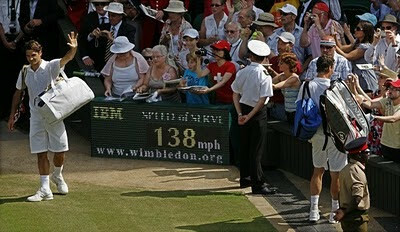 The countdown to Wimbledon is at a mere few hours right now, and there's going to be a lot of great players taking to the lawns. And one I thought was going to be great, and I guess, possibly still could be. Let's see how opening day goes. 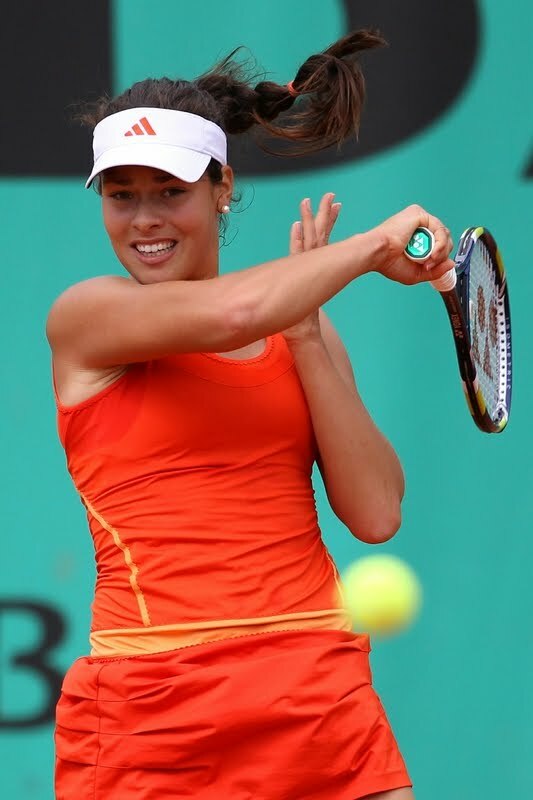 Former world number one Ana Ivanovic takes the court against 13th-seeded Shahar Peer. It's a little wild to see Ivanovic enter a Slam unseeded, but with the results she's put up since mid-2008, it can't be too unexpected. This match with Peer, though, could do wonders for her if she were to pull it off. Not to take anything away from Peer, but Ivanovic has hit heights Peer could have trouble ever attaining. I think this match could be a huge opportunity for Ivanovic. She's had some glimmers of hope the past couple of years, but just when you think she's back on course, another improbable loss pops up. Can she pull off the upset and string together a few wins? And then can she use that as a springboard for the rest of the year? I guess we'll find out soon enough! 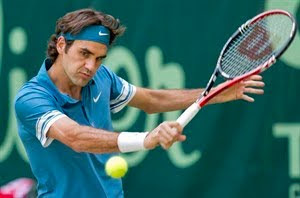 In my last post, I was thinking, "Man, that was a rough loss to Lleyton Hewitt for Roger Federer in Halle." And that was just the latest perplexing result from Federer in a year full of them so far. But as it gets closer to Wimbledon time, I just can't help but think we'll be watching Fed do what he does best in two weeks: kissing that big gold trophy. He'll get tested but I think he'll come through. That's how I see it! The women's preview is coming next! I was just thinking earlier in the week, "Man, Halle should be a cakewalk for Fed. He's won it multiple times, he's able to hit the grass a little earlier. Smooth sailing." I guess Hewitt had other ideas (and congrats to him). But it's not like Federer got blasted off the court; he just lost from an extremely winnable position, which is shocking in its own right. Despite this tournament-winless streak he's been on since the Aussie, I actually like him taking Wimbledon in a couple of weeks. Guys will be hard-pressed to take him going best-of-five on grass--even the last guy to beat him on the hallowed grounds, Rafael Nadal. Sharapova's Wimbledon chances, on the other hand, I'm not too optimistic about. Na Li is tough, but she's not exactly on my short list of Wimbledon contenders. Sharapova's ranking post-shoulder injury is built on success at smaller events, like Strasbourg and Memphis. Losing at this relatively small event can't be a great confidence booster. And I feel like a broken record for what I'm about to write (especially as how I mentioned it in the previous post), but I really wish Sharapova stayed off the clay courts for a couple of years until her shoulder's as close to 100 percent as it's going to get. It's just not doing her any favors playing on it. She should take the time off to prepare for the faster conditions best suited to her game. Making her way back to true contender status at three of the four Majors should be her goal because right now, I can't say her odds of success of either of the final two Slams of the year are that good. * I was so happy to see how Rafael Nadal took it a little easier during the clay-court season than he has in years past, especially with the health concerns he's had recently. I just hope jetting off to London to play at Queens right after winning a Major doesn't come back to bite him over the next few months. * Speaking of the clay-court season, I think Maria Sharapova should avoid the dirt for at least the next couple of years: no Har-tru tournaments in the U.S.; no Strasbourg, where she won this year; and no French Open. Until there's absolutely no residual effects of any shoulder woes, she should save herself for the second half of the year, starting with the grass-court season. * But you know who I think should play more during the clay-court season? Andy Roddick. Losing to Dudi Sela today at Queens was pretty bad. Maybe it's me, but I felt that his moderate success on the clay last year helped him in his incredible Wimbledon run to the finals: His strokes were a lot sharper at the big W. I hope there was no thinking in his camp this year to save himself for the grass by not playing more on clay. * After missing the dirty days, Nikolay Davydenko has resurfaced in Halle. But he's gone again, getting knocked out of the tournament by Benjamin Becker. 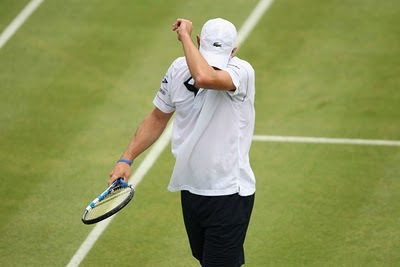 I don't know why Davydenko even came back right now when grass is his worst surface. * And what's up with Novak Djokovic, Andy Murray and Marin Cilic? Djokovic and Cilic lost today while as of this writing, Murray's down big to Mardy Fish. Those three really didn't do anything at all on clay during the spring stretch, and it looks like their so-so form is carrying over to the turf. Guess the clay-to-dirt move can trip up the best of 'em! 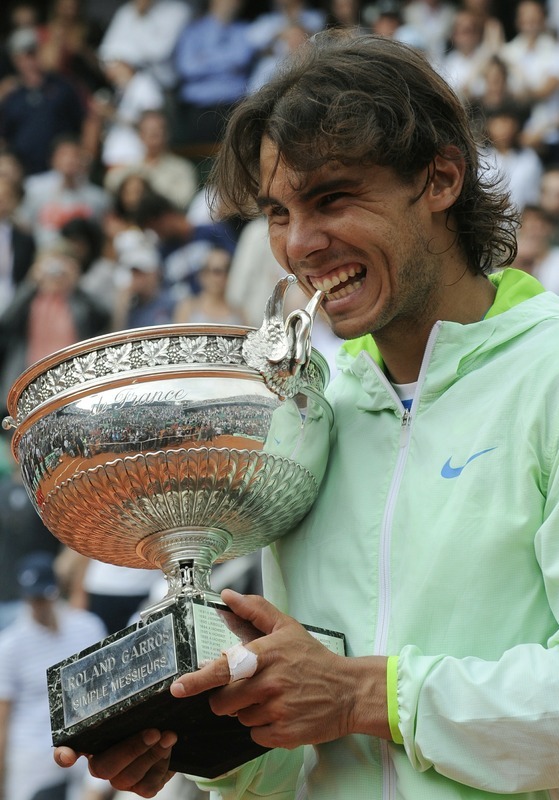 Rafael Nadal can easily, EASILY, win at least four more French Opens before he turns 30 years old. That puts him up there in Navratilova levels as far as dominance at one Slam goes. Because if Robin Soderling couldn't stop him, then no one can--and I mean that in all seriousness. You see, I've been nurturing these thoughts about men playing on clay for a couple of years now as to where if you're a big guy with a flat serve and a booming forehand who thinks attack, then it should be an ideal surface. Look at the games of the three other semifinalists: Soderling, Tomas Berdych and Jurgen Melzer. Soderling and Berdych are near mirror images of each other, while Melzer plays more of an all-around game he adapts to any surface (there's not many guys out there with final-round appearances at both clay and grass-court events nowadays). But if what I think is an "ideal" way to play on clay can't get it done against Rafa, what can? Not to discount him, seeing as how he just won the French a year ago, but I don't think Roger Federer will be able to. It's my opinion, but I feel he's going to have a harder time with the Soderling types in the years to come. It won't be any of Rafa's countrymen, like David Ferrer or Fernando Verdasco, who barely manage to win sets against him despite thir clay-court acumen (I just wanted to use that word!) We saw what happened with Soderling and Melzer against him. Maybe Juan Martin del Potro? I don't know; It could be a couple of years before he's back in Slam-winning shape. Whoever, whenever, whatever: It's gonna take a lot for others to stop Rafa from rolling at Roland Garros. If he keeps playing at this level and setting his schedule smartly to prevent more wear and tear on his body, I don't know how he can be stopped. I'm sure there are a lot of other inquiring minds out there wondering how! The first time in a long time? And I'm not talking about blogging here! But aside from that, I can't recall the last time there were four semifinalists on the women's side at any Major that hadn't won a Slam before. That's usually the kind of statistic I live for! I tried to go back and figure it out, but it was just too much to comprehend. If any sport has been marked by dominance, it's women's professional tennis. But this has been a nice change to see, and I think any tennis fan would be happy to see either Schiavone, Jelena Jankovic, Sam Stosur or Elena Dementieva win. Sure, it might be at the expense of one of your favorite players, but the game is better for it.